Hey Jaime, great question! I know there are so many people out there who love the idea of color, but tend to play it safe with neutrals. Having a neutral base in shades of gray, taupe, cream, white, or brown will stand the test of time, and also allow you to experiment with color in different ways. First, when thinking about color, my best advice to you is to ask yourself how you want to feel when you enter your home. Color is so closely tied to emotion. Do you want to feel energized, stimulated, and inspired? Then you’ll likely be looking for bold vibrant colors. Do you want to be soothed and nurtured? You are probably more drawn to muted tranquil tones. Asking yourself how you want to feel is an important first question when looking for ways to bring color into your home. Next, find your inspiration. Your source for choosing color can come from absolutely anything, whether it’s a fabric, a favorite flower, collectible, piece of art, a favorite article of clothing or scarf, or even something more intangible like a favorite vacation destination. Perhaps you love the colors of the sea, or the vibrant hues of a sunset? The opalescent tones in an abalone shell? The intensity of a magenta orchid? The deep red skin of a ripe heirloom tomato? Nature is always a great source of inspiration. Choose something in your home that you love, or look to nature. Find something that makes you feel good when you look at it, that’s your best cue. Once you’ve decided how you want to feel, and what specific things inspire you, then it’s easy to choose a favorite color or colors, and you build from there. Now that you’ve picked your inspiration color or colors, here are a few ways to incorporate them into your home. 1. Paint One Piece. 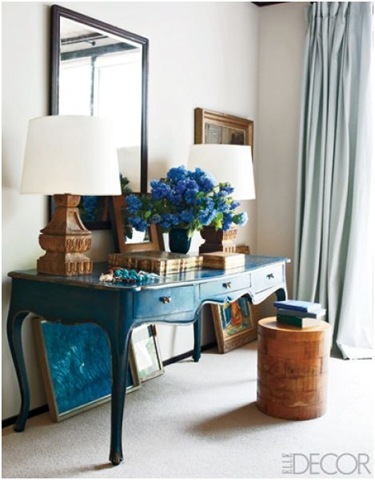 Choose a piece of furniture in your house and paint it that color that speaks to you, like this beautiful desk painted an intense peacock blue. 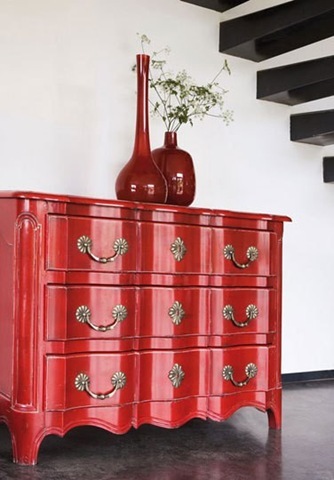 Or this high gloss bold tomato red! 2. Panel Panache. 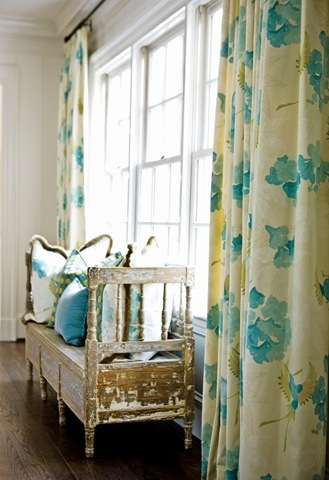 Pick window treatments that really stand out against a neutral wall, and complementary pillows in a similar shade. 3. Accents + Art. Colorful accent pillows paired with a vibrant piece of art never fail to bring fresh color into a mostly neutral space. 3) Be brave with your chairs. Keep your furnishings, rugs and window treatments neutral, then add bright accent chairs. A few more accessories in that same shade will pull the space together. 4. Choose a colorful rug. 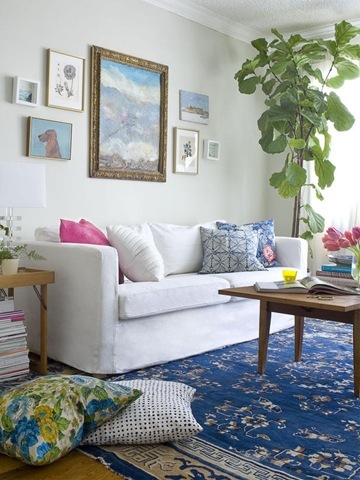 A bold color for your accent rug is a guaranteed way to bring color into your home. The fact that it’s underfoot makes it a bit more subtle, plus you can take cues from your rug’s colors to add a few accents around the room. 5. Pick A Pair. There are many color pairings that always work well together, hot pink + turquoise, yellow + gray, orange + blue, lime green + teal blue, coral + citron, gray + pink, the list goes on! Pick two colors you love that also work together, and pull both of those colors into your home with accessories and art. 6. Fabric Cue. 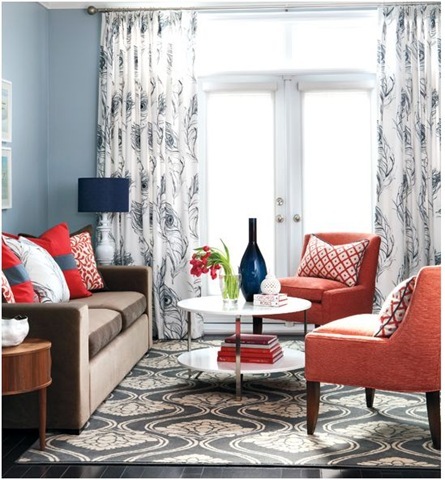 Pick a fabric with a pattern you absolutely love, then pull a color from it, and paint the walls that shade. It works every time! 7. Accessorize! 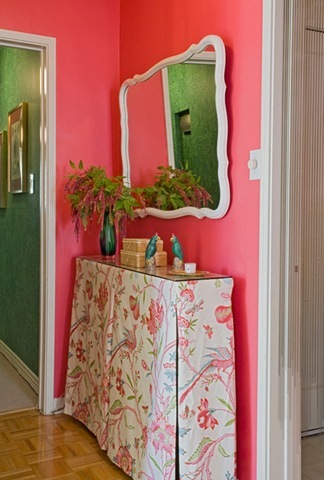 Collect items in your signature color, then play off that bold color in a softer shade on the walls. 8. Color Only Your Walls. 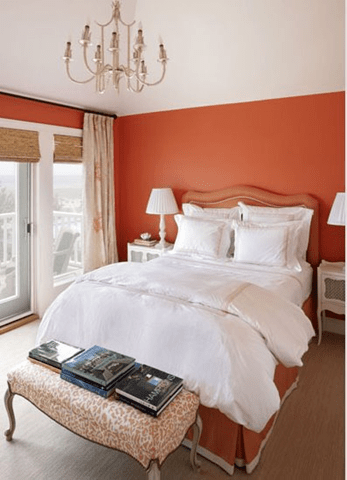 Stick with wood and neutral furnishings, then paint the walls a bold color. You’ll have tons of impact at minimal cost. 9. Think Monochromatic. 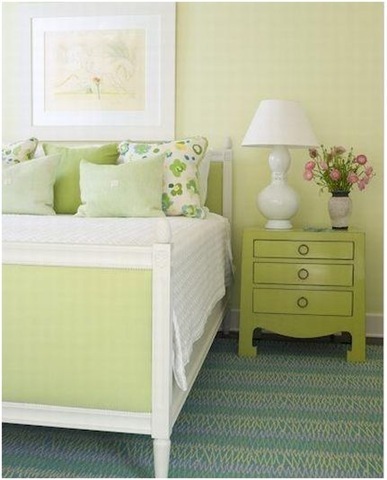 The restful bedroom uses several shades of green including apple, celadon and spring green. 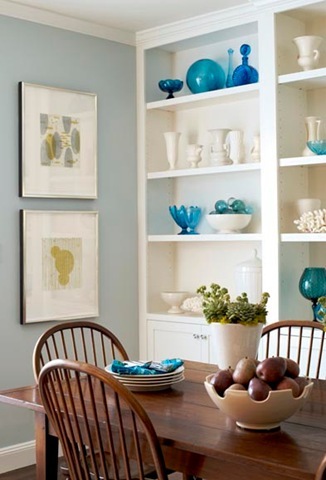 Various shades of blue are mixed with white and rich wood in this dining space. Rich eggplant and aubergine pop against the crisp whites in this bedroom. I hope this has given you a few ideas for your home Jaime! Always keep in mind how rooms flow together, and ask yourself how the choice to use color in one room can affect the other, and whether those choices reflect your lifestyle and personal style. I very easily tire of a certain color, so I definitely want all my rooms to have a neutral base. I add color through window blinds, blankets, cushions, ornaments and art. Sometimes also through some inexpensive thrift store piece that I pain in the color of my liking. It is easy and a good way to start, and really – the small details makes a huge difference. You do not need that much or such a big colored area, just keep it constant in the room. I took the risk of adding color in my home office. I’m usually a neutral person and add color with my decor. I’m happy how my office turned out. These pic just motivated to finish decorating it. This was an AMAZING post! I just loved looking at all the pictures. They are each gorgeous in their own way. Thanks for all the great tips in the post too. I have been wanting to add bits of blue to my living room and now I can see orange and blue go great together (already have orange in the living room now in accents). Thanks for the great article! Love this post! I’ve been working on injecting some color into my living room through the artwork and pillows. Thanks for sharing these great inspiration pics. Thanks for the great tips – I think I will return to this post again and again to remind myself not to be afraid of colour. My rooms never seem to be complete – the last touch is colour, a great post, thanks for sharing. Great inspiration pics! I’m currently searching for a table to paint peacock like the desk in the first pic. Love it! So glad you posted this today! I’m wanting to sell my house within the next two years, and hesitant to paint the walls. However, I want color!! This post has shown me that there are lots of things I can still do to get that POP! Thanks so much! Don’t you just LOVE colour!!!! What a great post with tons of wonderful advice and pics. You gave some really GREAT tips! I have that mirror in the first image in #6! and the navy blue room is saved as inspiration for my room for Room Service Atlanta! Oh, and that purple room just made me want to paint my room purple! But my husband would think I have lost my mind with purple paint in our room so I’m only adding accents! This is a great post! Thanks for your time to write all this. It helps me, the color challenged girl! I was just telling my DH that I feel the need to update our family room, now I’m inspired! Great post, Kate! Given that I’m in the midst of making color decisions right now, it’s nice to read this that helps bring my focus back on the fundamentals. Sometimes it can be overwhelming trying to make color decisions and translating what’s in your head to what’s in your room! Such great tips and I love that glossy red dresser and blue desk. Great inspiration pictures! Great tips. As someone who lives in an apartment, decorating can often be a challenge. Everything is defaulted to neutral tones, so figuring out how to add color and interest without being allowed to modify much is always a challenge for me. I have already incorporated some of these ideas, but definitely plan to use more. Thanks for the post! Thank you for this great post! I am an everyday reader but infrequent commenter! I love every tip you provided, and those gorgeous pictures! I saved half of them for inspiration to access later. Great advice!!! Your inspiration pics clearly illustrate your exapmles!!! This is a must bookmark article for me! I love your pictures, and I love color. I will be looking at these again for ideas! Wow thanks so much for all of these ideas, I too feel like Jaime! My walls are currently beige and all our furniture is tan or brown even our curtains!! 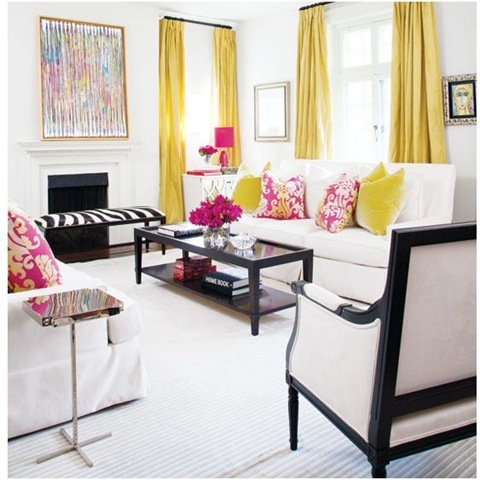 I love the patterned curtains and pillows idea, I think I will start there! Love your inspiration pics! Great post – thank you for the ideas! Great suggestions. I like what you said about painting one item. Sometimes on shot of color can get you hooked and it’s easier to go from there. Love the “fabric cue” suggestion. Great article! Thanks for the linky party too … sorry I am so late! Great post! I love how each room follows the chosen color theme. Very inspirational. great tips! My house desperately needs these tips. I fall under the same brown, beige, darker brown, ligher beige category…haha :-D Now I just need to dedicate myself to changing it! Awesome post and beautiful pictures. You are the next Martha Stewart Kate! WOW!! These are FANTASTIC!!! Thanks sooo much for all this helpful advice and info!! I really needed it at the moment!! Have a great week!! 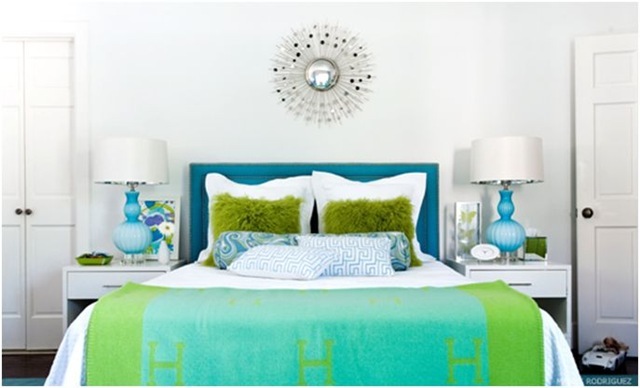 What awesome tips to help spruce up a room with color. I absolutely love all the inspirations you’ve collected here. They are chock full of ideas! Thanks for answering that question. Mine would have been that exact one! Everything in our new construction home is brown and boring. Now I have a starting off point! Thanks! this is a great post kate! 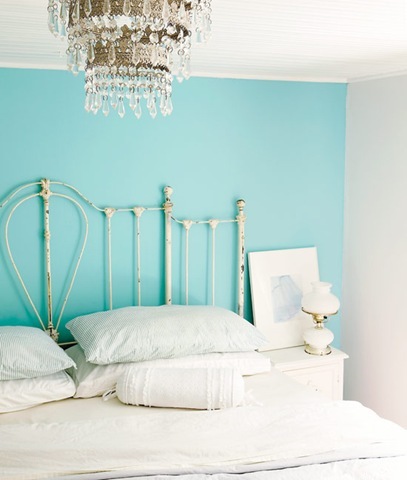 i love all the different ideas for bringing in color – in my head all i can come up with is to paint the walls! I love this post! I’m graduating from college in May, and I know I’ll be taking my brown and white furniture pieces with me to my new apartment. Thanks for the helpful tips and inspirational pictures! If a picture is worth 1,000 words then this post surely speaks volumes. Your format, a guideline followed by multiple interpretations, is one of the best. Great tips and beautiful inspirations! Thanks for all the wonderful suggestions. I know I’ve heard most of these ideas before, but they were random — just one tidbit here & another there. I love that you posted a whole, cohesive list. Bookmarked? You betcha’!!! This is a beautifully written and illustrated post, Kate! You give very good and workable tips for easing people into color. Thank you for answering this reader’s question so thoughtfully–we all benefit from your knowledge and your insight! Wow, excellent post! Thanks for all the great tips! This was such a fun and informative post to read. There were so many great pictures. I especially love what you said about choosing colours based on how you want to feel. It’s so true. I want to feel happy and refreshed in my house, so lots of white and colour for me! Thanks Kate! I’m like Jaime – too much brown/beige college stuff taking over my house. This post is a super helpful way to “inject color” – I just never knew where to start and this gives some great ideas! Wow! I just looked around your blog and I love it…how did I not visit before now? Thanks to Karen I’m here and I’ll be back! Great post! Awesome Janet, so glad you took the plunge! Happy shopping Joanne and Heather! Thank you Richella and Karen, how kind! Great advice! I am a victim of my own poor choices. I am trying to get back down to a neutral base so that I can accessorize my home with some cheerful colors and more modern patterns. I’ll be featuring this on my own blog this Friday. :) I think your helpful tips will encourage a lot of readers! LOVE your post today! Serious eye candy!!!! Great tips for color! I will be coming back to these for future reference. When I was a young newlywed(36 years ago) we lived in an apartmnet and we were not allowed to paint. I craved color, so I wenty to KMart and bought some inexpensive print king size sheets. My husband chuckled as I stapled them to our bedroom walls..Perfect! Instant color that was not permanent and could be changed easily. What a great post….lots of practical tips! I so need to win Lotto so I can every single one of these rooms! Love the inspiration. The wall color on the last pict is so gorgeous! I’m having similar color anxiety, so what I’ve decided to do in my new place is pick a general neutral scheme I know I like (grays + white), and add a different color to it for each room (+ teals and blues in the living room, + yellow in the bedroom, etc). I figure if it looks horrible I can always swap out the colored accessories and the basic neutral room I know I’m fine with will still be there. Wow- these are great inspiration photos! Love seeing things in a fresh new way!! This was a great post, Kate! Jaime had a great question and your post was perfect. Lots of great tips and beautiful photos for inspiration. I’m following your fabric cue tip. I found some gorgeous fabric today and am trying to pull one of the less dominant, but really fun colors, out of it and paint the wall. It’s a bold move for me but I’m going for it! Thank you for these beautiful colors! I am so tired of gray and white! I want to live in every single one of those rooms! What great eye candy you choose to prove your points. Great ideas and great tips. I am saving this post. There are too many inspirational photos for me not to. That first one especially – WOW! Hi Kate, I am so inspired by the Martha image with the orange chair I need to go post it :) Thanks for the inspiration! My favorite color used in a traditional setting — true love! Love this post, love color. We are crushing on seaglass for our bathroom/bedroom also. I’m currently working on trying to incorporating pink and teal into a living room but it can be so hard to find a balance. I love the turquoise and purple rooms. Beautiful. I really love this post and am just returning to read it for the second time. 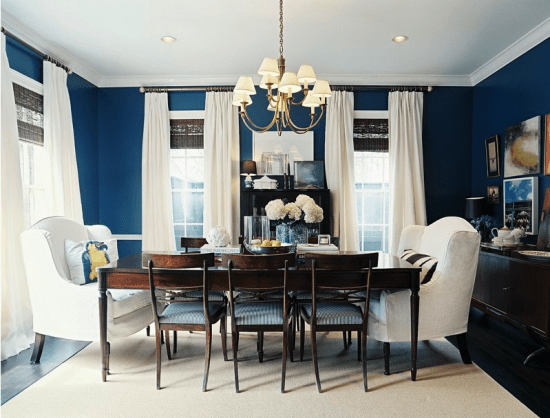 I recently looked around my house and was struck: blue of some type is a dominant color in my: 1. dining room, 2. kitchen, 3. master bedroom, and 4. children’s bathroom. I think I need to work on varying that a bit! For me, it just works so well into any type of room. I’ll flip through these ideas with the thought of changing at least one of those, probably my bedroom. Just cannot say how much I enjoy your writing and thought processes. Thank you! Fabulous! So practical and easy to use advice. Thank you so much! WOW! What an inspirational post, Kate! I love the precise way you present your ideas! Just a perfect article with such beautiful images! Thanks for so many great ideas! Brilliant, Brilliant post! Such acheivable ideas. Thanks! I love the examples that you have here. I am looking to redecorate but have a base colour problem. I love this website and it has such great ideas. Keep it up. Very inspirational.